Are you planning on diving in caves? Or perhaps you enjoy the beauty of nature by exploring those cracks where colorful marine fauna live? For many diving excursions there’s no denying a good dive light is a must have for both safety and enjoyment. But furthermore, the best dive light won’t compromise your comfort. Here are a few of the best dive lights so read on to learn how to pick your next light. Which Batteries Does the Dive Light Need? How do You Plan on Using Your Dive Light? What Are Some Benefits of Dive Lights? What Attributes Differentiate A Good Dive Light From An Ordinary Torch? What Is The Best Dive Light? Dive lights come in different sizes, specs and price tags. This might make the process of selecting one for the right purposes seem overwhelming. But we’ve got you covered. Below are a few elements you might need to take into consideration before making a final purchase. Before going any further, you must determine what you want to use the dive light for. You need to be aware of the type of lights and their consequent functionalities. Primary Dive Lights: Ideally primary lights should be very bright and have long-lasting batteries. Selecting this type of light is ideal if you’re looking for underwater lighting and night diving. Secondary Dive Lights: This dive light is normally more compact and lightweight. This light usually comes in as back up in the event that the primary light fails. Photo-video Dive Lights: As the name suggests this dive light is ideal if you’re planning on doing a mini video and photo shoot underwater. Selecting a dive light with a wider beam angle will be ideal if you’re planning on going for a night dive. This wide angle will ensure maximum visibility. If you need a closer inspection by looking under ledges, a dive light with a smaller beam angle will do. This is because it provides you with a tight bright spot. This type of beam angle is also perfect for lobster hunting. There are basically three types of batteries you can select from depending on your budget and intended usage. Traditional alkaline batteries: If you’re not looking to spend a fortune, these cost-effective batteries are a good pick. They’re readily available but their only downside is they might not be as durable. CR123 lithium batteries: Though they come at a relatively higher price compared to their alkaline counterparts, their performance is excellent. Unfortunately, they may not be readily available in remote dive locations. If you’re environmentally conscious you’ll love that they’re recyclable. Rechargeable batteries: These are a diver’s dream if you’re into frequent diving. They’re cost effective because you don’t have to buy new batteries each time you want to go diving. Their only downside is they take time to charge so prior planning is recommended if you’re going to use these. Selecting the dive light with the right material is also important as it ultimately impacts the quality of light. Below are a few materials. Xenon Dive Lights: While they’re cost effective, they don’t necessarily provide the best light. They have shorter battery life spans. But if you’re into underwater video and photography, they‘re the best selection. This is because the light won’t have that bluish tint associated with LED lights. LED and HID Dive Lights: These are the most popular dive lights for diving junkies because of their excellent brightness, durability and energy efficiency. 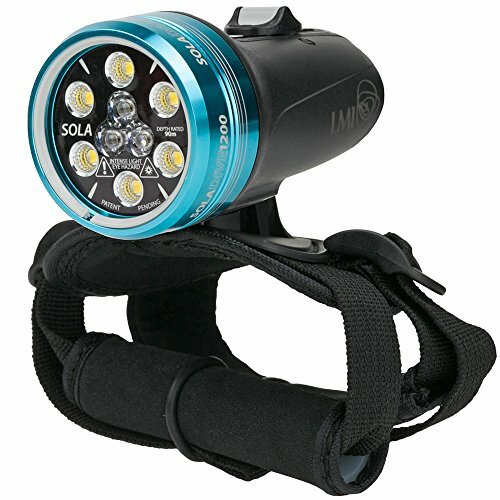 Are you planning to use your dive light during day- or nighttime? Do you want to inspect small cracks or view broad seascapes? The last thing you need is a heavy dive light when you plan on being underwater for a long time. Rather opt for a small handheld narrow beam light you can easily store in your pocket. Dive lights come with a host of benefits mentioned below. Security of grip: The ideal sizes and shapes of grips will be determined by what you want to use the dive light for. There are basically three types of grips: torch, pistol grip and the Goodman handle. It all boils down to a matter of preference. How easy is it to use? : Are the switches and controls intuitive? How easy is it to select power levels or switch to emergency flash in the case of an emergency? You must opt for dive lights that are easy to operate. Durability: A light that can handle long periods of use is recommended. The last thing you want is to cut your adventure short because of a dead battery. What is the waterproof level of the dive light? : The waterproof level will determine how deep you can dive while still getting adequate lighting. A dive light with a water proof level of up to 30m means you can use it efficiently within 30m of the surface. If you’re however planning on going for a deeper dive this won’t suffice. Light output: What is the quality of brightness your dive light produces?More lumen means more light. It’s as simple as that. An ordinary dive light usually has an output of at least 100 lumens. Bright dive lights can go all the way up to 2500 lumens depending on the quality of the beam. What we like about this dive light is it offers an 800-lumen flood and 500-lumen spot output. This is great because you can regulate the light output to make sure the light doesn’t dim. You can decide to alternate between spot and flood light because it comes with a 60 degree flood and 12 degree spot underwater beams. The beauty of this particular product is it was tested under water for accuracy. Another excellent feature is the colored status LED that indicates the battery level. If you don’t want the hassle of carrying a light around it comes with a standard ballistic Cordura hand mount for hands-free use. It has powerful, compact and rechargeable dual beams and multiple power settings. You can easily adjust it to the light type you want. Another good feature is the locking lever which is great for conserving your battery by preventing the dive light from accidentally switching on. 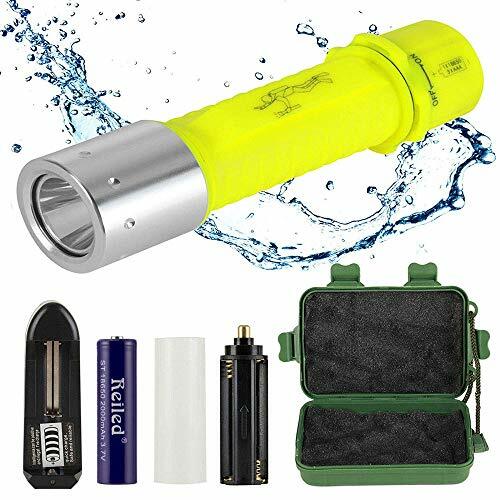 This light comes with a high intensity LED and an excellent battery life, so if you plan on being underwater for a long time this might be a good selection. Apart from its compact size, this dive light comes with a narrow penetrating beam. This is useful because it means you can use it for a variety of industrial, fire or utility applications that require a lot of light. Another excellent feature is it has complete waterproof reliability. Although it’s not specifically designed for hazardous conditions, you can easily fit it into a tool box and use it to aid in some of your handy work. For a secondary dive light, it offers one of the brightest lights because it comes with 400 lumen and 10 hours of burn time. 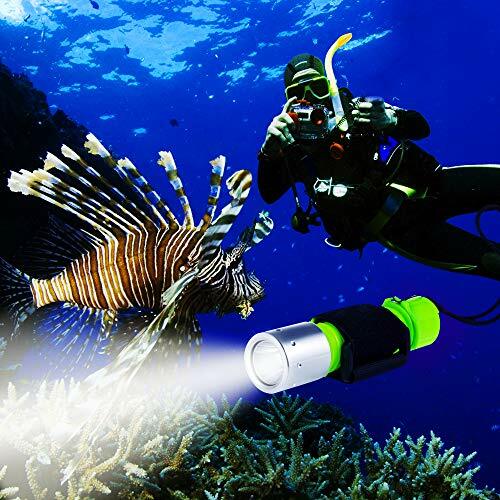 We love this dive light because it comes with a USB charger. It’s water- and shockproof, and made of aluminum alloy. This material protects the dive light from premature abrasion. If you’re a deep diver you might like this light. 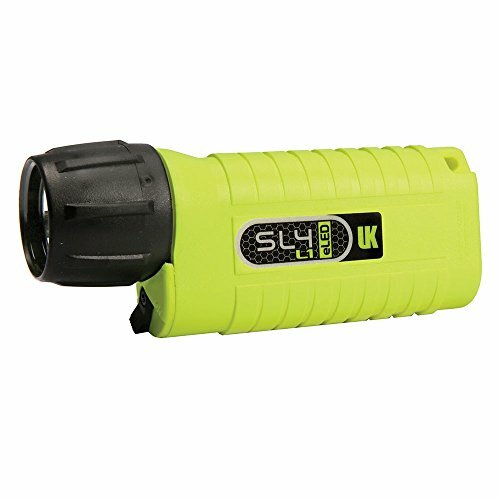 It has the highest waterproof level compared to other dive lights. This makes it safe to use under water up to 150m. You must, however, screw on the cap of the flashlight before diving. Medium light can last up to 20 hours while low light can last up to 30. We love the versatility of this light because it can also be used for camping, hiking or night diving. Another excellent feature is the slide switch which will help you control the light from off to full-light brightness. You also have the option of using rechargeable batteries or disposable ones, which is a great option. It comes with high/middle or low brightness levels so you can adjust the light to suit your needs. This light is perfect for a number of underwater activities which include scuba diving, diving or even fishing. You can enjoy a full battery life of up to six hours. Another great feature is the 3-switch mode; you can switch from high to medium to strobe. If it’s important to switch for different scenarios this light could be useful. It’s made of high-quality materials which make it durable. If you’re all for saving money and not planning on buying another light in the near future, this might be for you. It comes with a waterproof design that will enable you to dive into water up to 100m deep. This is a medium-sized intensity LED which is great for a long burn time – from 14 to 18 hours! Isn’t that amazing? So if you’re looking for the best dive light for recreational diving this will do the job. If having a reliable backup light is important to you, this light might be your best bet. If you’re into stealthy tech looks, the body of this dive light is made of rugged gun metal aluminum. With a length of just 95mm it’s an incredible useful secondary light and it comes with 220 lumen illumination. Another excellent feature is the long lanyard cord. You can easily keep the dive light fastened to your BC. After all is said and done based on the above research we have a personal favorite: the BlueFire Scuba Diving Flashlight is our best pick. Not only does it come with an extended battery life of up to 30 hours, you can also use it for other recreational activities. This includes anything from camping to boating and everything in between. We love the fact that it’s shockproof and it’s coated with anti-abrasive materials which are a plus where durability is concerned. This light has the highest waterproof level compared to other batteries. So if you’re thinking of diving very deep and need reliable gear, you’ve found your solution.